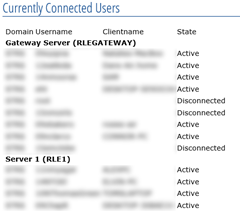 A while back I wanted a way to show our users how many people were logged in to each host in our Remote Desktop cluster. After many hours of research and a few of development, I came up with ‘RDStat’ – a simple program that ran quser.exe on a regular interval and pulled the data into a text file. The text file was then displayed as a series of bar charts when users logged in. This proved to be popular – users could now see when they were accessing the servers at busy times and would logoff and do their work another time. Requests began coming in for this to be accessible before they logged into the server. I modified the script that was polling quser to produce an html file instead – and served this up via IIS. Again, hugely popular but as always, users want more! I’ve rewritten ‘RDStat’ several times over the past few years, but I think it is at a stage now where it is fit to be released for general consumption. Remote Desktop Statistics has several components, all of which can be embedded into a public-facing website should you wish. ‘StatDesktop’ – a small program that runs on start-up which displays to users the current load on the RD infrastructure. ‘RDPAutoSign’ – a service that watches a given folder for new RDP files that meet a given criteria. It then signs the files using a designated certificate. You can download the binary RLE Stat Package along with all the supporting documentation below. It has been tested on a Windows Server 2012 R2 configuration. Before extracting, make sure you remove the ‘mark of the web’ from the Zip file -> right click -> properties -> unblock -> OK. If you use this in production, please leave a comment below and let me know and consider donating (see about me page) so I can carry on producing awesome stuff! Its Amazing. Thank you so much for sharing.